Normally, we tell you what some great new device is for and then tell you what it can do. This time, though, it makes sense to write it the other way around, because Mr Everything ($250 on Kickstarter) is meant for, well everything. Okay. Mr Everything is a powerbank, capable, of charging phones, tablets, laptops, and even jumpstarting your car. It’s outdoor ready, which basically means it’s waterproof and has a convenient handle for carrying. It also supports Qi wireless charging, so your Qi devices can charge while other, non-magical devices use the ports, of which there are four (Oh, and you can get the Mr Everything Plus, which includes a universal AC outlet). It also has Bluetooth speakers, a ring of LED lights along the bottom, and storage space on the top for all your stuff. So what do you use Mr Everything for? 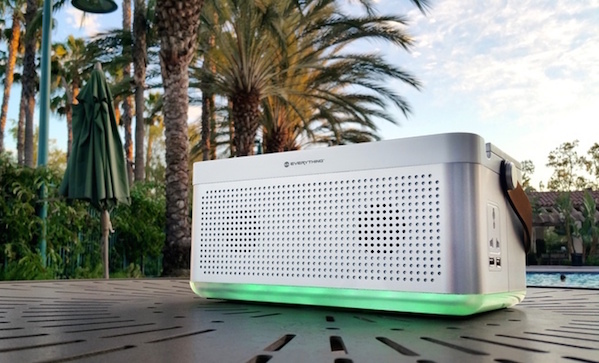 Take it camping, to the beach, to a picnic, or any other outdoor leisure place, and it will provide music and a place to keep/charge all those pesky devices. Or keep it in the trunk of your car for emergency power situations. Or charged up at home for the same reason—not only will it charge things during a blackout, but the extra light is handy too. Or you can fill the storage full of first aid stuff and suddenly you have a smarter first aid kit.